What would make you carry twenty condoms full of narcotics in your stomach? My automatic answer to this question was “Nothing”, but what if your families’ life was at risk if you didn’t? Welcome to the movie The Mule. Swallowing around 20 condoms full of narcotics, Ray almost makes it home before he nervously loses his cool in front of security, landing him in a nearby motel so the drugs can flush out of his system. Under the watchful eyes of Detective Croft and Detective Paris, Ray struggles to keep his secret hidden, inflicting bodily harm by avoiding deification. Can Ray keep himself out of jail by swallowing more than his pride, or will the drugs make their appearance in the filthiest of ways? Regular listeners of the Moviewallas podcast will know that some of my favorite movies are Australian; indeed I own my own copies of Strictly Ballroom and Muriel’s Wedding which are well worn by now. 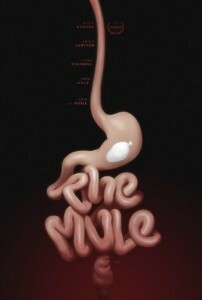 So it stands to reason that I was equally fascinated, disgusted and thoroughly entertained by the movie The Mule. Beware though; the toilet humor in this movie is like none that I have ever seen before and definitely not for the faint hearted. Brilliant acting by an incredible cast including Hugo Weaving, Leigh Whannell (who also shares writing credits) and Ewen Leslie elevate this movie from a good black comedy to an incredibly smart and surprising dramedy which will have you sitting on the edge of your seat as you try to figure out how it will all end for poor Ray. The twists and turns are not predictable and the story is original, if it wasn’t based on a true story, I would think it was unbelievable. This mule is definitely worth a ride if you can get your hands on it.